In 1870, at the age of 24, Carl Fabergé took over his father’s quaint St. Petersburg jewellery store. By then, he had already formulated the principle that the value of an object should be determined by the quality of the craftsmanship and not by the intrinsic worth of the materials. He also maintained that a modest, well-mounted jewel was superior to a large, brilliant and poorly mounted diamond. 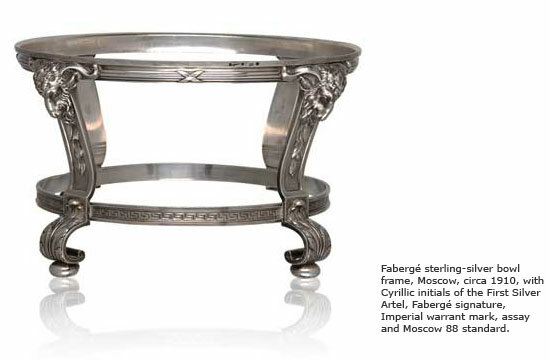 The piece illustrates not only Fabergé’s perfectionism, but his respect for the craftsmen’s individuality and his interest in appealing to the Russian middle class. Fabergé revived enamelling as a complex art form during the reigns of Louis XIV through to Louis XVI. By studying the decorative arts of the court of Versailles, he came to understand the beauty and complexity of enameling. It was with the guilloch√© style that Fabergé achieved stellar heights of mastery during his prolific career as the court jeweller to the Czars of Russia: Alexander III and his son, Nicholas II. In creating the worlds most sought-after enamelled objets de vertu, only Fabergé’s primarily Scandinavian workforce was privy to the exact process, which to this day remains a secret. We do know that the guilloché technique is achieved by engine-turning the metal surface with radiating geometric patterns. Fabergé further refined the process. His craftsmen would often apply an extremely thin plating of platinum over the engine-turned surface. The translucent-colored enamel was then successively applied and fired in at least five layers. Fabergé’s foremost work resembles the wave-like pattern of moiré silk. his father’s position within Fabergé’s firm upon Augusts passing. Fabergé’s enterprise was ultimately dedicated to the production of luxury accoutrements for royalty and the aristocracy. He also appealed to the tastes of the middle classes who admired but could not afford his jewels. For example, his sterling-silver bowl frame, pictured here, was both practical and affordable. It was created and engraved by the First Silver Artel, a group of independent silversmiths who crafted more affordable objects for Fabergé between 1890 and 1917. The workshop continually experimented with new guilloché patterns, resulting in a collection of distinctive designs. 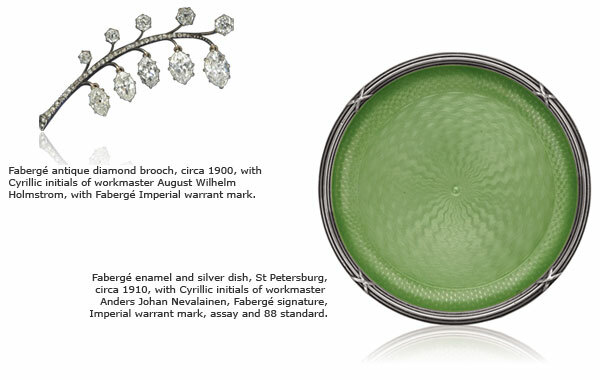 Fabergé was constantly creating and seeking new colors of enamel with which to decorate his works; thus far, he is noted to have used 144 different shades in his oeuvre. Each piece was painstakingly hand polished for hours, resulting in the noted smoothness of his pieces. Although many of Fabergé’s creations were functional items, his talent lay in the creation of supremely elegant decorative objects. It was the combination of proportion, soft yet rich hues of enamel and the mesmerizing intricacy of the guilloché patterning that led to the artists abiding fame. If jewels could talk... What stories they'd tell!